When you think of comfort foods, what first comes to your mind? I used to think of hot and carb heavy foods like casseroles, pies, and pasta dishes. However, my view has changed over the last little while. I’ve been working with All-Bran Canada developing delicious comfort food recipes with a delicious fibre kick. Comfort food + fibre for the win! Experts recommend 25 grams of fibre per day and many Canadians only get half that amount. I’ve been working on upping my family’s fibre intake and let me tell you that it’s not that hard to do. There are SO many ways you can easily incorporate more fibre into your diet. One visit to the All-Bran Canada recipe index and you’ll be inspired! 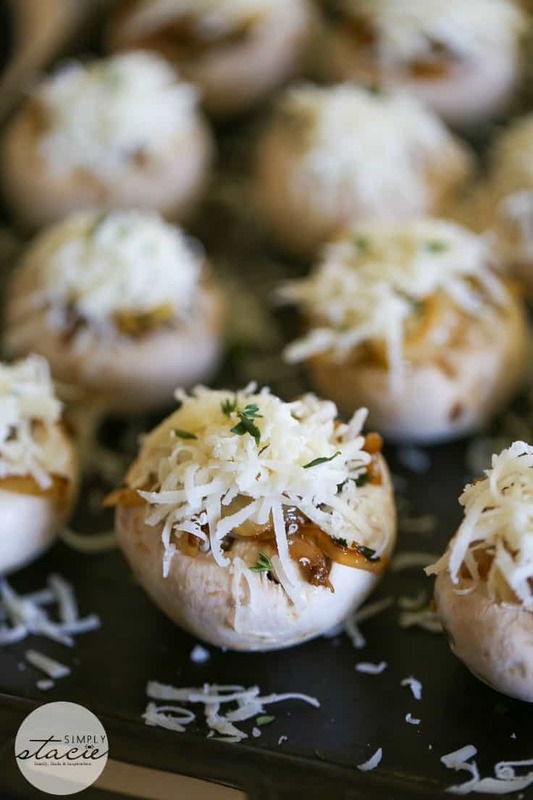 For your upcoming holiday parties, you’ll want to pin or bookmark this post! 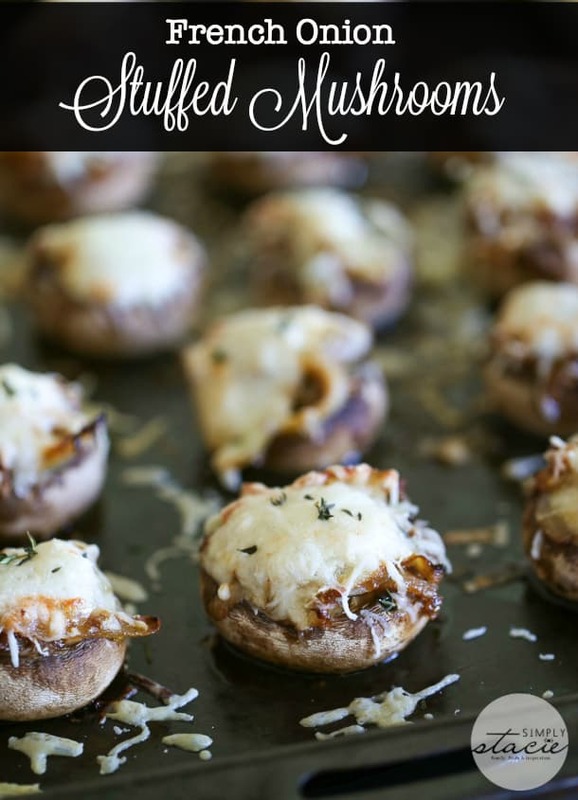 I have an appetizer recipe that you are going to love. 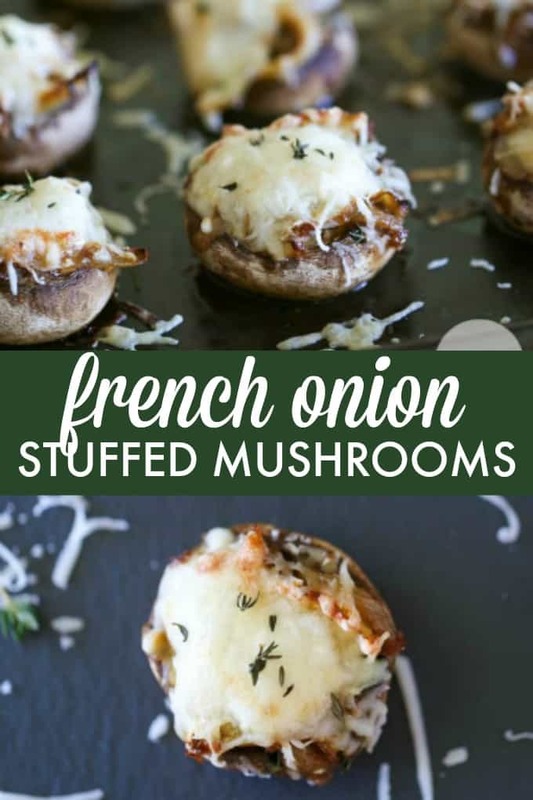 Here is what you’ll need to make a a scrumptious batch of French Onion Mushrooms. 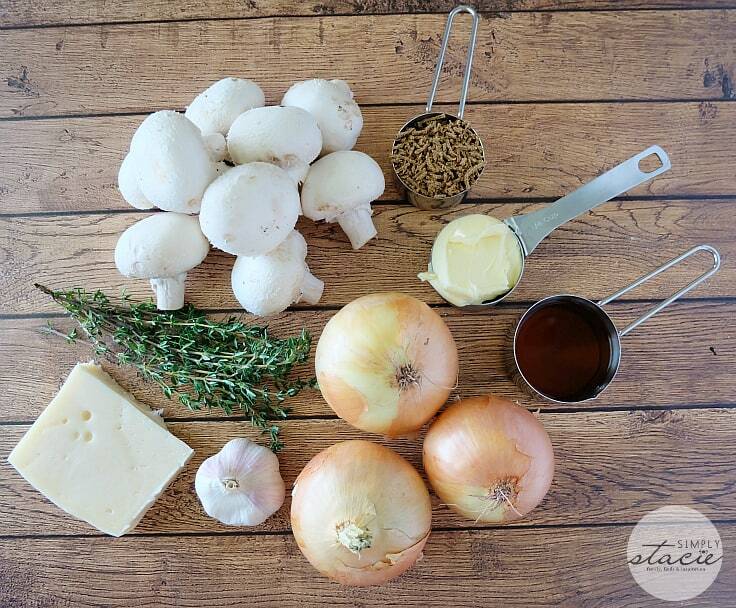 We’ve got All-Bran Original cereal, onions, garlic, Swiss cheese, fresh thyme, beef broth, butter and of course, mushrooms. It starts out similar to making French Onion soup. 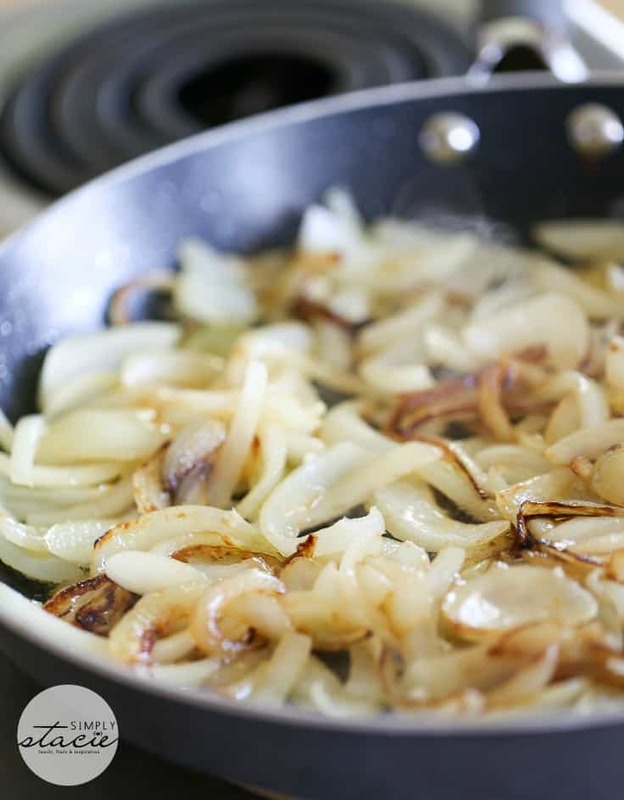 You’ll need to caramelize the onions in butter on the stove top. 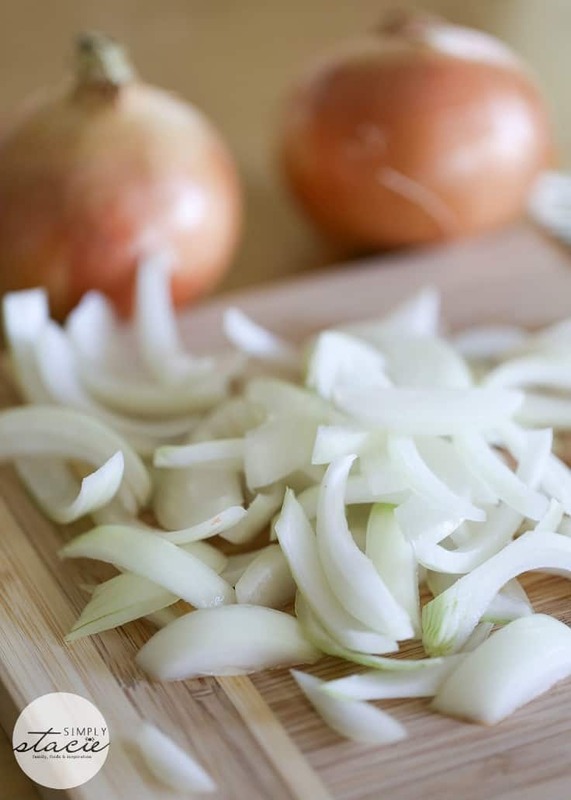 It may look like a lot of onions at first, but they will shrink down considerably as you cook them. 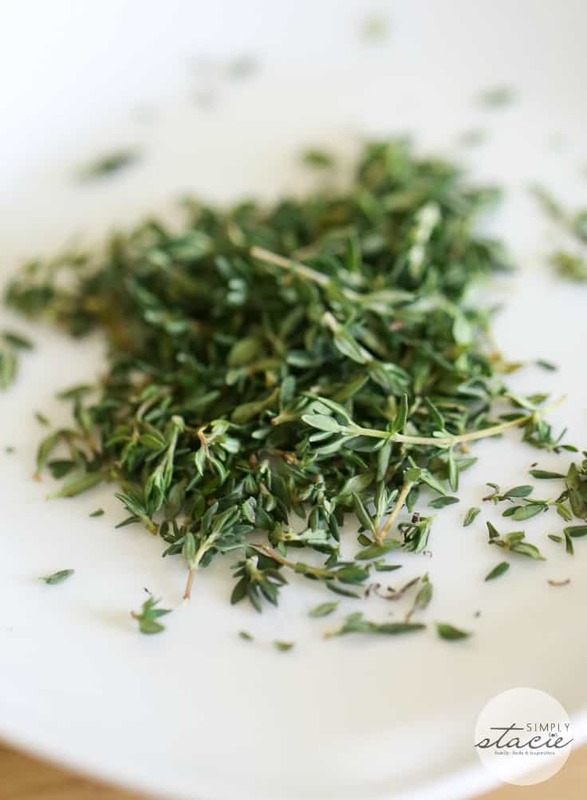 I prefer to use fresh herbs, but if you can’t find thyme, feel free to use dried (about 1/2 tsp). Fresh thyme adds a pretty pop of green for presentation which is another reason I like to use it. Towards the end of the cooking time on your onions (and garlic), the beef broth goes in. It soaks into the onions giving it another element of flavour. I probably could have ate them now straight from the pan. Willpower saves the day! 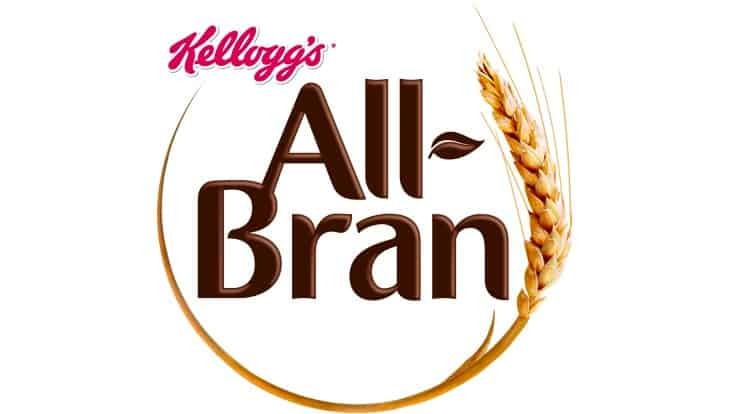 All-Bran Original cereal adds an important fibre boost and an extra bit of texture. 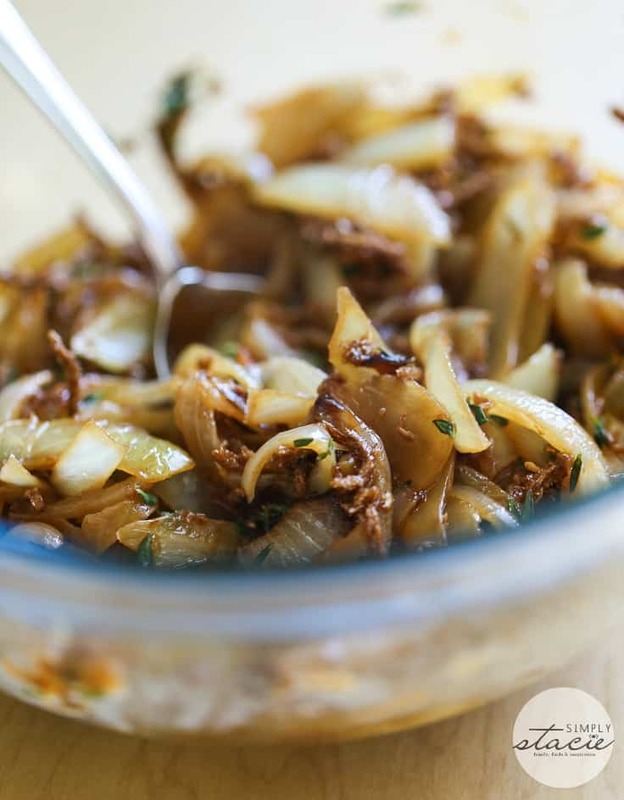 Once you mix it in with the onions, you’ll find that it will soften a little bit. I taste tasted a couple bites at this point – yum! It’s one of the perks of being the “chef”. 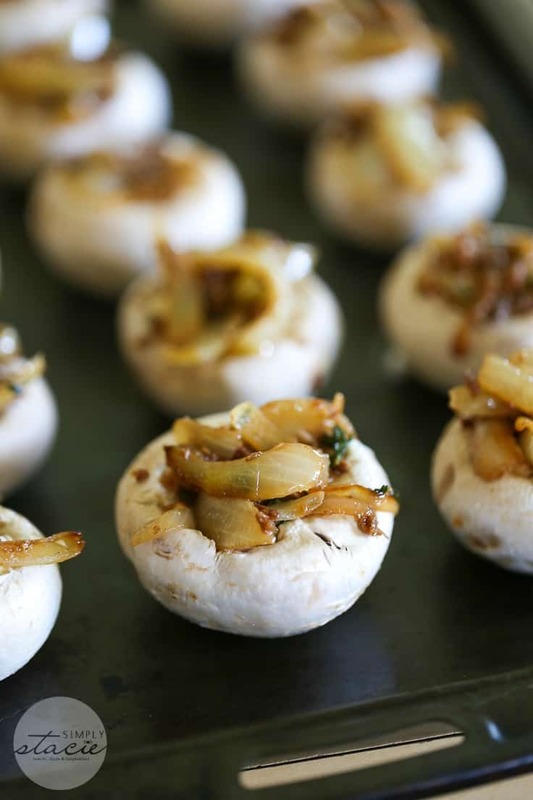 Then comes the fun part – stuffing your mushrooms. If you have kids, this step is something they can help with. It’s ok if they make a mess. They don’t need to be perfect! Plus, the cheese coming next will hide the flaws. 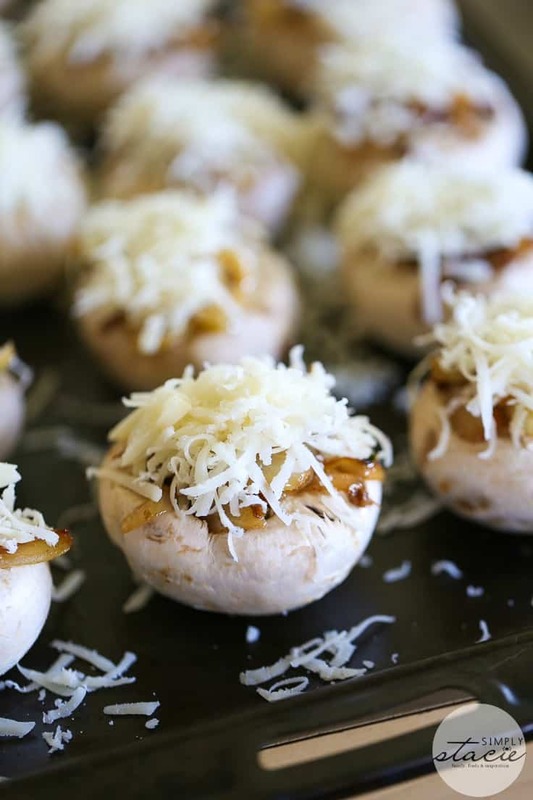 After you’ve added the cheese, these little guys are ready to go in the oven! Don’t forget to sprinkle on a little fresh thyme! NOW, they are ready. For real this time. 20 minutes later and next time you open that oven door, these bite sized beauties await! Resist grabbing one right away because they will be HOT! I’m not much of a dainty eater so I didn’t take little nibbles. I popped the whole mushroom in my mouth to experience the flavours and textures simultaneously. They are GOOD! I love that they have the bonus fibre in there and help me reach the daily recommended amount. If you’re craving more delicious recipe inspiration, make sure to visit All-Bran’s new Pinterest page. I’ve been actively pinning a bunch of recipes to try over the last little bit. They’ve got so many yummy ones posted already. All-Bran has teamed up with three top Canadian chefs to share 15 delicious new “comfort food moderne” recipes this fall! These are healthy, upscale comfort food recipes with a fibre twist. It’s easy to indulge and eat healthy too! Go on over to All-Bran Canada’s Pinterest page and pin your faves to try this season. You might also like this escargot recipe. What do you do to ensure you’re getting enough fibre in your diet? Try these fibre-packed bites of heaven! 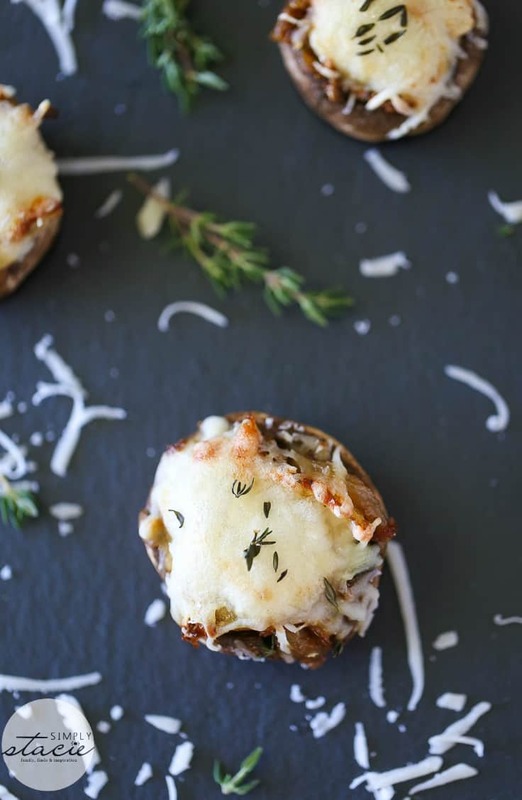 These French Onion Stuffed Mushrooms are not only delicious, but also healthy too! Melt butter in a pan over medium heat. 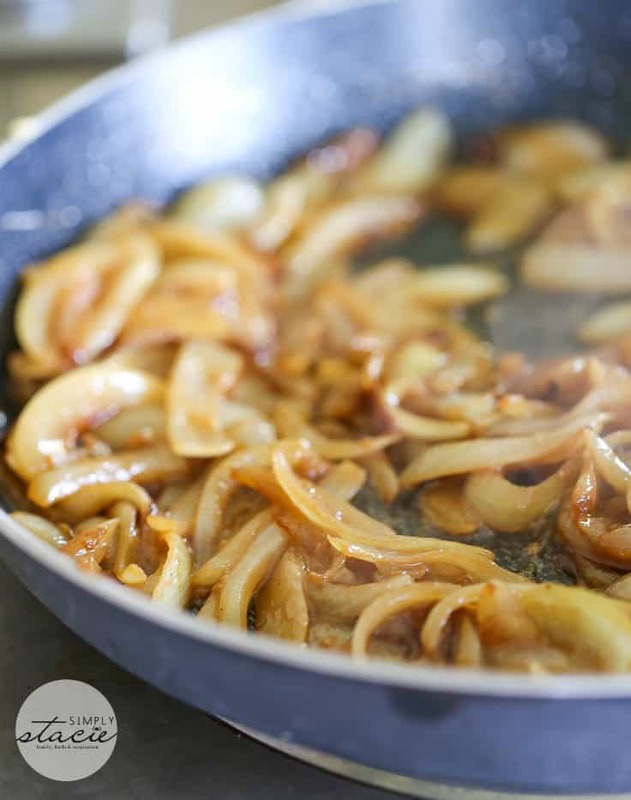 Add onions and caramelize for 15 minutes. Add in garlic cloves and continue to caramelize for an additional 3 to 5 minutes. Stir in beef broth and cook for 2 more minutes. 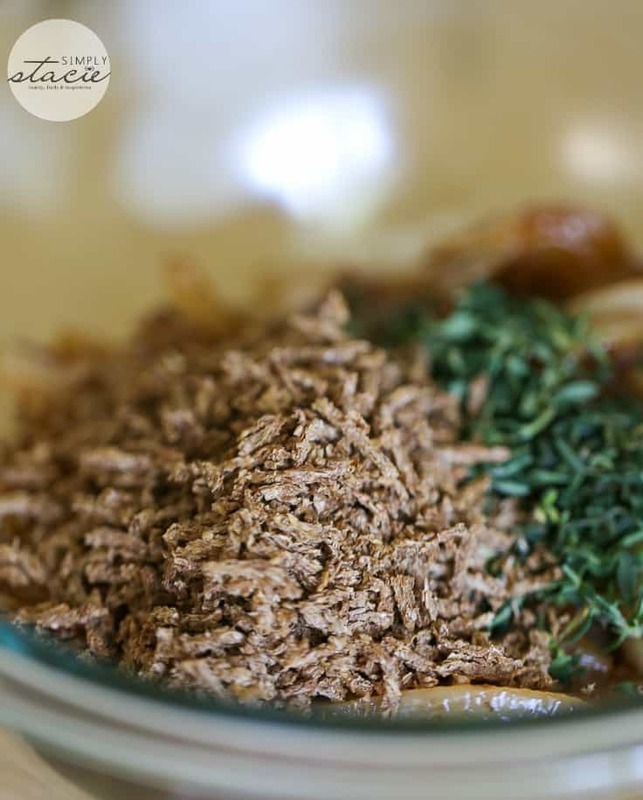 Add onion mixture to a medium bowl and add in thyme and All-Bran cereal. 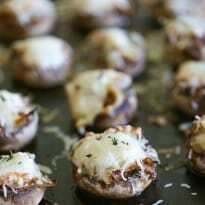 Add about a tsp of filling to each mushroom and arrange on a baking sheet. 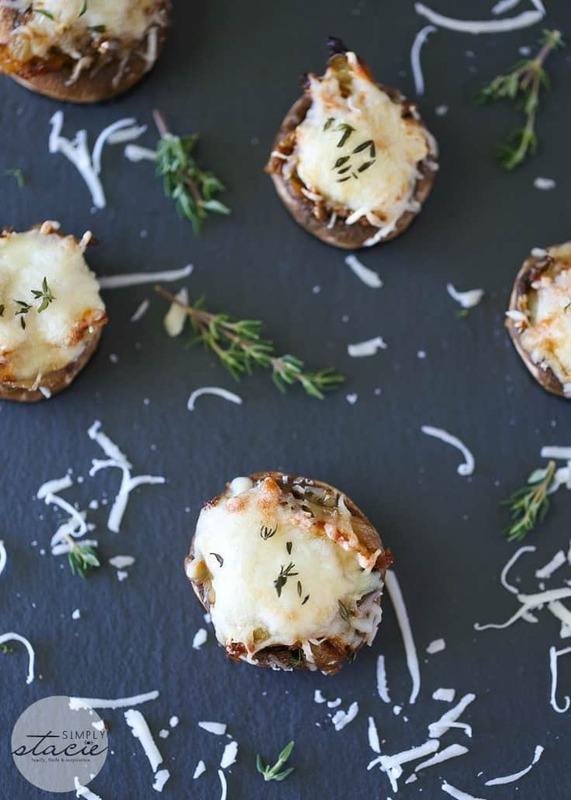 Top with cheese and garnish with a little fresh thyme. I would try the Carrot and Potato Pancakes! I would like to try the apple stuff squash recipe! I would like to try the No-Knead Bread. I’m going to try the blueberry bran pancakes. I use all bran to make banana chocolate chip muffins the kids go crazy for often.